Oh, I’m so happy and excited, yet very nervous…. I’m excited to be going to the launch of Tata Zest to the loveliest and liveliest place in the country, Goa. But I’m super nervous because it’s the first time I’m leaving my princess in the care of family members for more than a few hours. 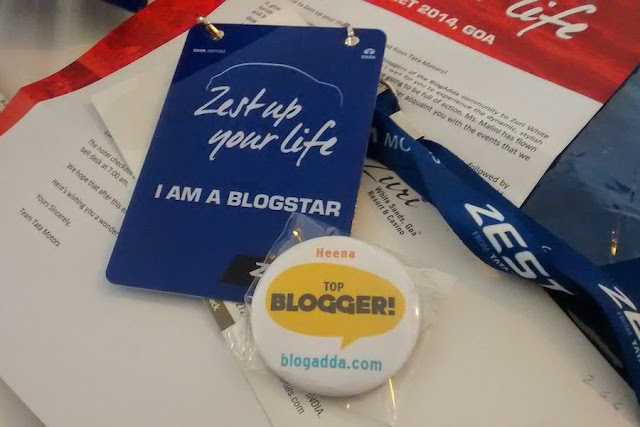 Sitting pretty on the flight I look around and see some wonderful fellow bloggers and I cannot hide my excitement at being with them for the whole weekend in a first-of-its-kind experience presented by Tata Motors. Who possibly in their right minds could pass that? After deliberating about going or not, I finally couldn’t resist and sent in my details. And then the eternal question in every woman’s mind came to mine. What to pack? Since Goa is the place you let loose and go crazy with colours and accessories ensuring comfort I ditched the denim and the nylons. I rummaged my closet for my shorts; a floral dress, a nice kurti and a jumpsuit, added an overdrive on the accessories and threw in a few ballerinas while the heels took a step back. A pretty sling and a night clutch made it through too. The coastal city is notorious for frizzing up hair, and so my go-to Bed Head Frizz control range made it to the vanity pouch along with my sunscreen and a few other makeup essentials. Phew, too much for a 2-day trip? You think? Nevermind. We’d be staying at the Zuri White Sands where we’d be treated like royalty. I’ve stayed there before and can vouch for the amazing experience; yes you can feel jealous when I post loads of pictures and updates on twitter and instagram. Clue… Follow me! If I get a breather I sure will be bringing back some souvenirs for some very special readers… Stay tuned to instagram for those!